I’m on a peach craze right now. They are just so fresh. Aside from this perfectly grilled sweet treat, I’m also obsessed with my brown butter caramelized peach pancakes right now. I made those pancakes in multiple variations when my mom was in town and they were a HIT! Highly recommend. Anyway, back to today’s recipe and despite the school year about to begin, there’s still plenty of grill time upon us. Grilling fruit is epic. Seriously. Let’s talk about these for a second. 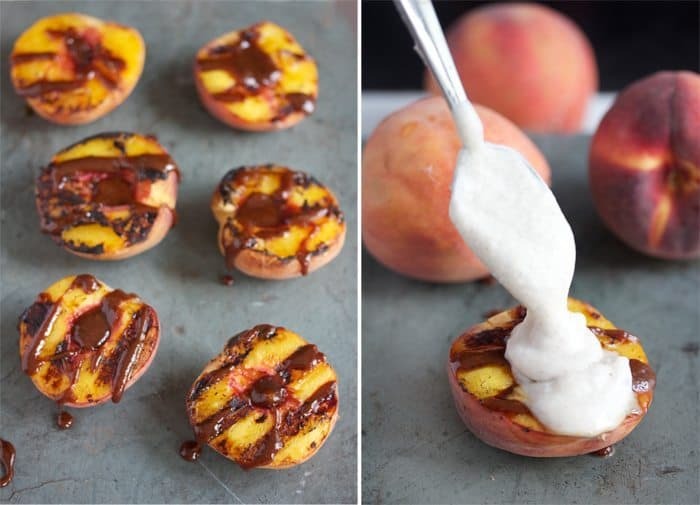 Grilled, warm peaches covered in gooey caramel and topped with a cinnamon whipped cream that is packed with protein. Step 1: Grill. Step 2: Caramel drizzle. Step 3: Whipped Cream. Easy as that! Heat grill to 400 and grease. Disclosure: This is a sponsored post. I was compensated for the time spent developing this recipe. 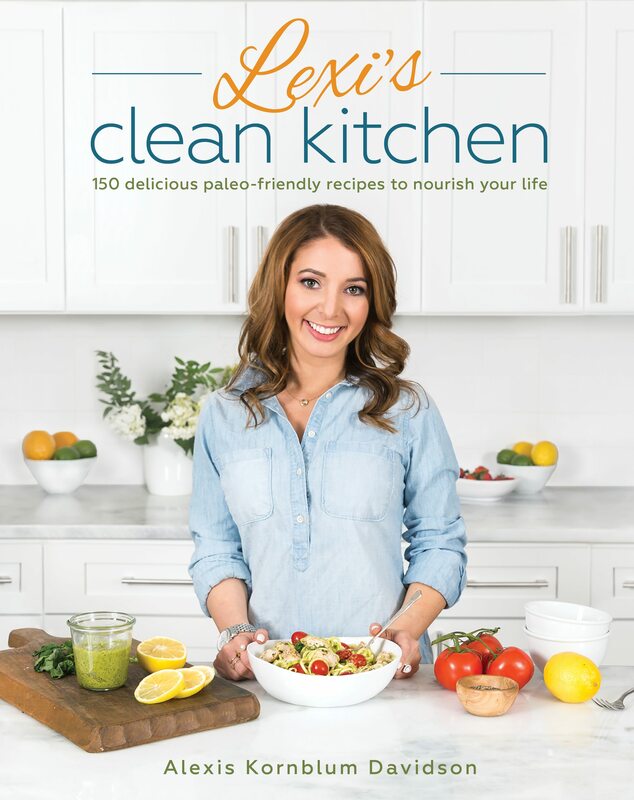 All opinions expressed on Lexi’s Clean Kitchen are always my own. 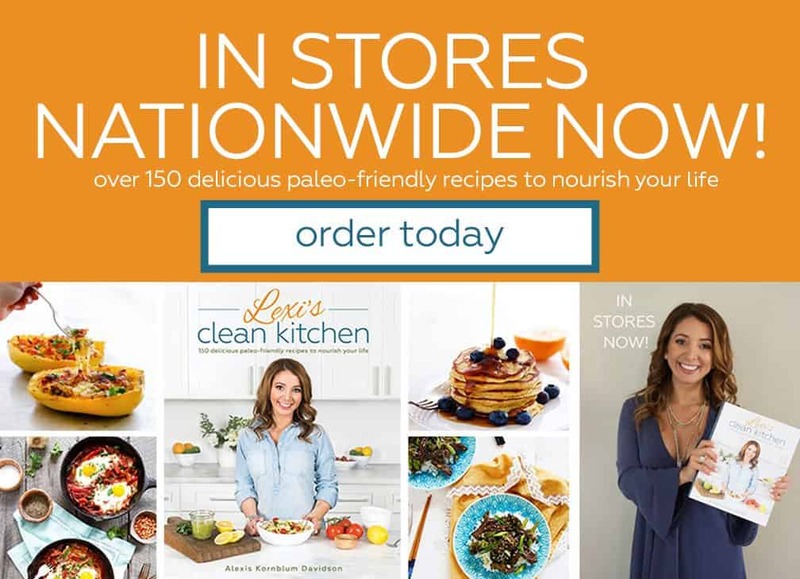 My sponsors help make this blog possible! I love that you added protein powder to the whipped cream. What a great way to add some nutrition. 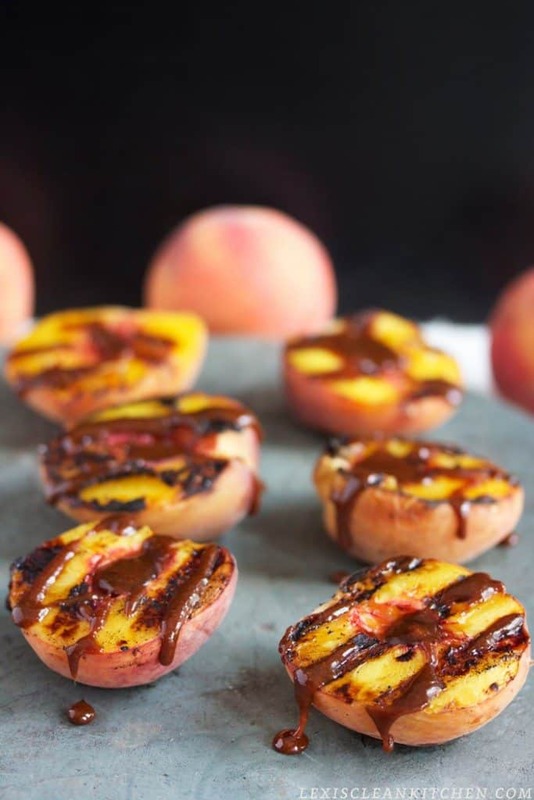 Grilled peaches are amazing as is but you made them even better. 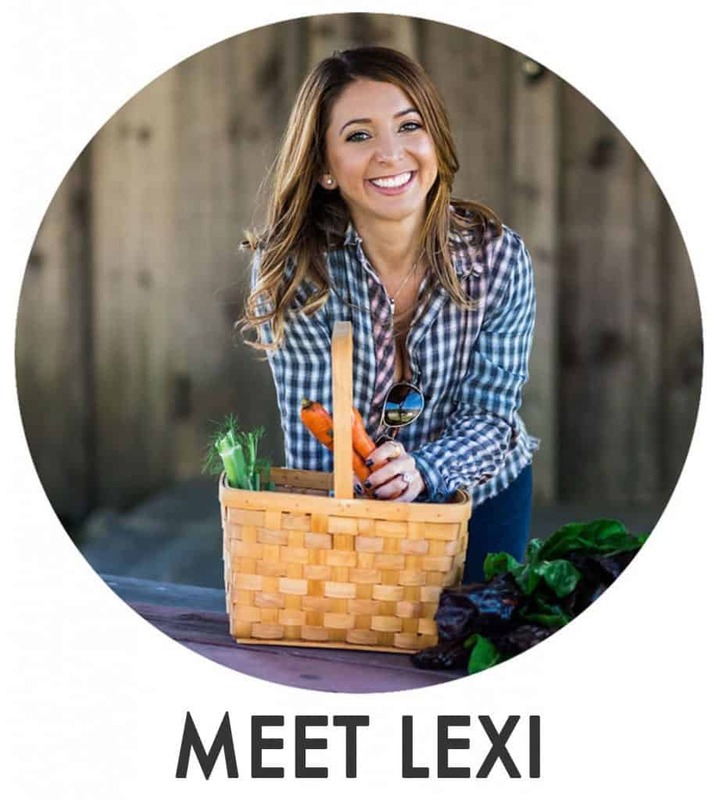 Lexi, I haven’t tried grilling fruit yet, but I think you convinced me.. I am drooling looking at your photos! Thank you beautiful!! We missed you!!!! And we need to plan something asap. My mouth is watering as we speak! I love the grilled peaches and the cinnamon and protein whipped cream! I have only made a vanilla sauce to top strawberries but I think I need to try your version here! And I love grilled pineapple but I decided peaches are next! 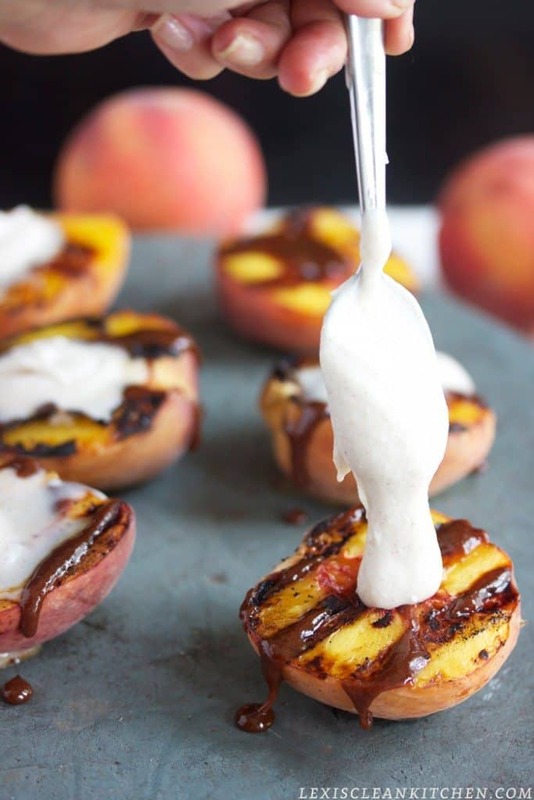 I love the protein whipped cream and grilled peaches -yum! Were the peaches you used firm to the touch and you let them soften on the grill or were they ready to be eaten before you grilled them? Thanks for sharing! These look amazing! Our backyard has been under construction all summer and I’m having grilled food withdraws. So many things just taste better grilled.